“Rescue Me” is a recurring column by Samantha Randall, editor-in-chief at Top Dog Tips. She’ll provide personal anecdotes and perspective about her life as a pet lover with a passion for cat and dog rescue. Today, in honor of National Dog Week, she offers tips on how to give a rescue pet as a holiday gift. The holidays are upon us! Are you planning to give a dog as a gift? While pets offer unconditional love and irreplaceable devotion, you should think long and hard before presenting a pet as a surprise present. Generally, most animal experts and shelters advise against adopting a dog to give as a (surprise) gift to someone else. However, if you’ve discussed this with the future pet owner, it can be a great holiday addition. 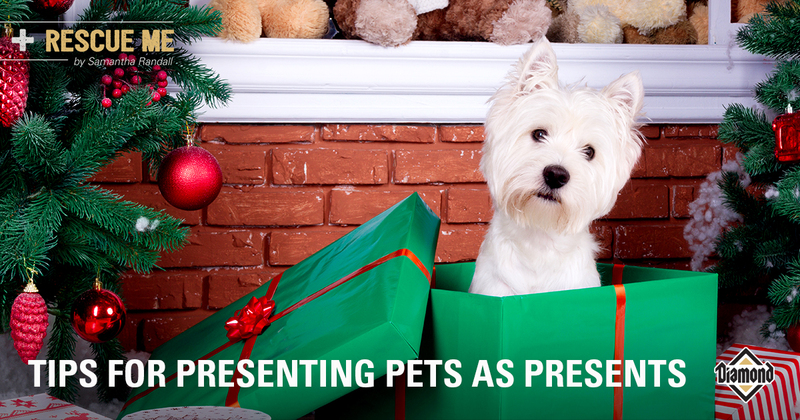 Here are a few things to ponder before setting out to get and give a dog as a gift. Adopt a dog from a shelter instead of a pet store. Dog adoption fees are a lot cheaper at pet shelters, and there’s never a shortage of well-behaved rescue dogs that need a forever home. You’ll help shelters and homeless pets, as well as discourage puppy mill breeders, if you go with a rescue dog. With over 6.5 million pets at shelters, your small gesture of finding a home for one pup is going to make a big impact in the life of that particular animal. Avoid adopting a dog on an impulse, especially when you’re doing it as a gift. You or the new pet parent must be ready for the responsibility of caring for another living being. Having a dog is like having a child in many ways because the pet owner needs to provide food, medicine, supplies (like leashes and dog crates), and their own time, as well as the dog’s emotional well-being. You need to carefully consider factors like the size of the pet, space in the house, the pet’s temperament; their needs for physical and mental interaction, and how those will jive with the new owner, among other things. You shouldn’t be in a hurry to make the choice. Take some time with the dogs at the shelter first so that you can be certain what kind of dog it is, and then consider who’s going to be caring for that animal. Will they be a good couple together? Surprising someone with an adopted animal you’re going to leave at their house is a huge no-no. You have to know firsthand if the person you’re gifting the dog to really wants to take a pet in. People don’t always have the time, energy, dedication, and resources to care for a dog even if they find animals adorable. Surprising the recipient with a dog might seem wonderful in the beginning, but it’s always better if they know ahead of time that they’re getting a pet, so that they can prepare for the responsibility (and decide if they even want that responsibility). You might want to maintain at least some surprise, but once again, it’s best to be prepared. Instead of going by yourself to the shelter, involve the future recipient in the process early on. Even shelter workers will tell you that it’s never a good idea to adopt a pet for another person. Getting a pet is a personal thing. I know parents who brought their kids to the shelter to show a particular dog, only to be surprised that the kids were drawn to a different animal. You see it often enough in movies where young children receive dogs as Christmas presents. It might be a delightful thing to witness, but when the holiday high wears off, your recipient has to focus on training and caring for the dog. Remember, the responsibility of caring for the animal doesn’t end after you take down the Christmas lights. Even if you discussed adopting a dog together, there are better times to bring a rescue dog into a home than on holidays. It will be challenging to housebreak and train a dog during holiday time, with vacations and events and parties aplenty. If you’re really determined to gift a dog, do it after the holidays when everyone is back to their regular routines. This way the recipient can fully focus on raising and training the new pet. There’s a lot of love dogs can give to their owners, but having them in your life really does entail a lot of work. Only adopt a dog as a gift for people when the whole family knows and agrees on this. While your intention to gift the animal might be for the person who doesn’t oppose this, the truth is everyone else in the family will be involved in this dog’s life, one way or another. You can build up the excitement of adopting a pet by purchasing pet supplies weeks before the dog arrives. Think of this as an adoption kit to prepare the kids for their forever friend. Better yet, go shopping together for the stuff the dog needs to give the children an idea of the kind of responsibility they will be in for. Buy a book about dog care and read it together with your children. Unfortunately, some people see dogs as yet another thing they can buy and see the animal shelter as a sort of Goodwill outlet. When they don’t want the gift, they go to the shelter to “return” the dog. Make sure that is not the mindset you’re coming to the shelter with, and check with the recipient as well. Contrary to popular notion, senior dogs are not problematic dogs; in fact, they are often much better to be gifted than puppies. Senior pets are likely calmer and more familiar with basic commands already, so they can adjust more easily in the new home. If you’ll consider getting a senior dog, you’re also gifting this animal something truly great — someone’s love in the final years of life. Studies show that when dogs are given as gifts, the person who receives it will likely be more attached and treasure the animal more. However, there’s still a proper way to gift a dog. Be conscientious when planning this loving gesture and make sure that the dog won’t be on the losing end.